More than 7000 migrants may have lost their lives on their journeys to reach safer lands this year, according the the International Organization for Migration (IOM). 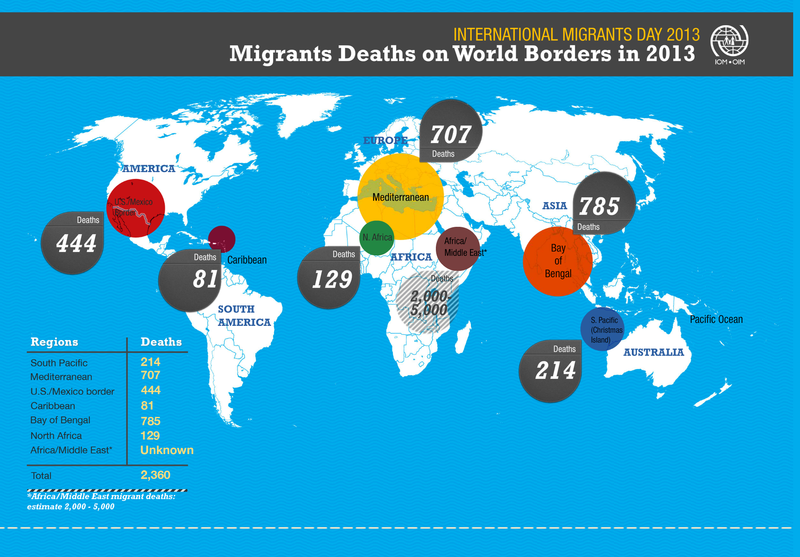 Marking International Migrants Day, the IOM reported that 2013 is likely to have been the deadliest year on record for migrants, in what it referred to as the first global estimate. This was based on information collected from border agencies and NGOs. This number was calculated from countries which share information on migration, mainly in the Western world - it is expected that the real cost of lives is much higher once migrants heading from Africa to the Middle East are taken into account. “We will never know the true total, as many migrants died anonymously in deserts, in oceans or in other accidents,” said IOM Director General William Lacy Swing. “On this International Day we focus on the well-being and safety of migrants. IOM calls for strengthening existing policies or developing new ones to protect the human rights of those who leave home to seek better opportunities. We are ready to assist our Member States and other partners in the development and implementation of policies," said Ambassador Swing. This year International Migrants Day was celebrated with a social media campaign. Supporters were encouraged to share their own stories online using the hashtag #IAmAMigrant. United Nations Secretary-General Ban Ki Moon lent his words to the campaign: "There are 232 million people living outside their country of birth, including myself. All of us are part of a productive global economy that benefits our world as a whole." “Migration is an expression of the human aspiration for dignity, safety and a better future. It is part of the social fabric, part of our very make-up as a human family,” the Secretary-General said in his remarks. Media turned attention towards dangerous migrant voyages this autumn after two tragedies near Lampedusa claimed the lives of more than 400 asylum seekers. EU immigration policies came under fire after leaders met to discuss the issue, ending the meeting without clear resolve. Two major pieces of journalism allowed us to experience a migrant boat journey first-hand. Two New York Times reporters boarded a boat from Indonesia to Christmas Island, exposing the treacherous conditions brave migrants chose to endure as it beat whatever hardship they had endured at home. Photojournalist and Hazara asylum seeker Barat Ali Batoor used his camera to document his own journey from Afghanistan to Australia, ruining his camera when the inadequate boat on his first journey sank. He managed to make the journey successfully in a second boat weeks later, while some of his fellows from the first journey were never found. Migration stories are so often reported as numbers and figures, while these two stories expose the people beneath. The IOM is also working to humanise migrants in the media with an ongoing campaign that focuses on what migrants – however they arrive, wherever they come from – have to offer. The campaign considers the 'baggage' people bring to their new home countries. “I’ve brought five languages, the courage to start a new life and a big voice for karaoke,” reads the print on one migrant’s suitcase. It is crucial that this attention is maintained so that leaders and policymakers will work to produce policy that supports the human rights and well-being of all migrants.